A lot of fear and irrational discrimination has prevented the growth of important scientific research into the use of psychedelic drugs. The continued drug war has stopped the flow of funding for research into means of using these drugs legally. In the 50s and 60s, there were some researchers making headways but the criminalization of drugs has stopped all the research. There are also a lot of strict rules governing research in these areas which makes research into this field costly. Psychedelic drugs like MDMA, psilocybin and LSD could be very helpful in the field of mental health. LSD and Psilocybin Mushrooms have been used to cure people privately, for research and to curb depression. These are just a few examples of how these psychedelic drugs are being used. Depression is a mental condition that lasts for long. Depression is hard to cure. But with the recent research into the use of psychedelic drugs, depression could become very easy to cure. Psychedelic drugs have been proven to have positive effects that last for long even when they are used just once. When LSD was being developed, its potentials as a psychiatric drug looked interesting. LSD was tested as a drug for treating various mental defects. There has been a study on old data collected from tests at various alcohol treatment facilities. This study has yielded interesting results on the use of LSD as a cure for addiction. The drug Ecstasy has also been proven to be useful for treating anxiety and PTSD. During a MAPS research, it was discovered that there was an improvement of symptoms associated with PTSD. Psychotherapy boosted by MDMA was compared with psychotherapy with just a placebo and it was discovered that there were important improvements in PTSD symptoms when measured by usual symptom scales. Recently, researchers in the United States discovered that depression rates could be reduced by ketamine. Psilocybin is a psychedelic substance that could have a lot of benefits medically and spiritually. This was revealed from research done by the John Hopkins School of Medicine. Psilocin and psilocybin are psychedelic compounds offer to give a psychedelic experience with a lot of visual effects. It also helps one think philosophically. Magic truffles and magic mushrooms both contain psychedelic substances which give one psychedelic experiences. The M.D. 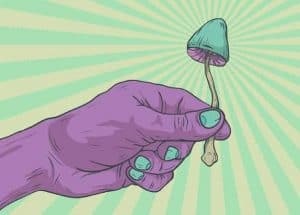 of UCLA, Charles S. Grob led a pilot study that was created to determine the chemical benefits of giving psilocybin to people that suffer from depression and anxiety along with chronic or advanced cancer. The people who participated in the study showed improvements after. They had reduced depression and anxiety for as much as half a year period after the dose they were administered. Psychedelics can also produce great changes in how aware an individual is. LSD and psilocybin have been used to study depression in many clinical procedures that are becoming routine. A research room will be setup to feel and look very comfortable. The participants in the research are then given a dose. A researcher sits with them for about 4 to 6 hours which is the length of the experience. Most times, the participants do not move and they rather enjoy the experience allowing their brains and body to relax. Studies that have been carried out recently has shown that psilocybin can work on the brain the same way that SSRI antidepressants like Prozac work. The effects are also the same as those taking medication and other therapies prescribed by medical practitioners. Researchers believe that the positive effects of psilocybin could last longer than the pills. Psychedelic experiences stop depression by means that are not often clear to researchers. But various theories have been proposed. Some reason that the drugs open pathways that have been previously closed in the brain thus allowing emotions to flow freely and making people feel more connected and rooted. The experiences that occur when one takes psychedelics could be responsible for the long-term impact.